This tour is an expert blend of history, tradition, culture and education. Perfect for people with a thirst for knowledge, the eleven-day trip is littered with castle trips and museums, all bursting with interesting facts. Get lost in the island’s long, colourful history as you enjoy driving through stunning countryside. 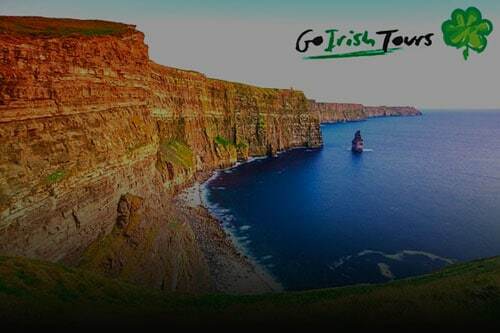 Beginning and ending in Dublin you’ll visit counties and cities including Waterford, Mayo and Kerry, taking in sights including Trinity College, Newgrange, Blarney Castle and Croagh Patrick. Starting off in Dublin, you will have time to absorb the charm of our capital city, be it a pint of Guinness in the Storehouse, the Georgian squares or the charming cobbled streets of Temple Bar, there is plenty to offer all types of visitor! Head on then to Meath and take in the Megalithic Tombs of Newgrange, an absolute wonder where the summer and winter solstices take place in a unique fashion. Close by is Trim Castle (where Braveheart was filmed). In the heart of Ireland there are two great distilleries making world-renowned whiskey – Kilbeggan Distillery and Tullamore Dew Distillery. Learn about the great skill in making these hand-crafted drinks and become an Irish whiskey connoisseur! From Meath you make the short journey to Waterford, where you can visit the iconic House of Waterford Crystal or journey on to the Copper Coast. Your journey will continue on to Cork, the Rebel County. Cork is a bustling city on the south coast of Ireland where culture and heritage abounds. You can visit the the old gaol (jail & pronounced jail too) or the seaside town of Kinsale. The Old Head Golf Course is there for the golfer who dares! The road continues to the charming county of Kerry, also known as the Kingdom. Dramatic scenery of the sea, mountains and lakes awaits you – there are so many photo opportunities of scenery, people and craic (Irish for fun). With two days here you have time to do the famous Ring of Kerry, take a boat trip to the Skelligs weather permitting (location of the filming of the new Star Wars movie) or a horse and trap trip through the Gap of Dunloe, there is so much to choose from! 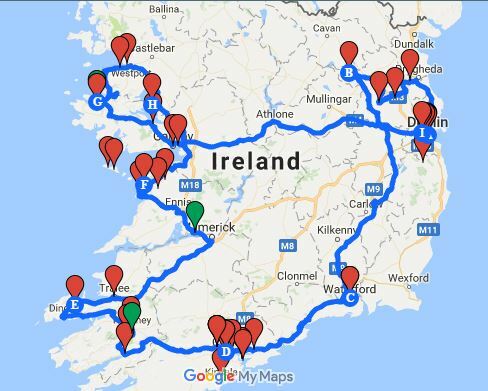 If you would like information on our other self drive tours please click here. Staying on the west coast you cross into Clare; a must-see are the Cliffs of Moher (Harry Potter quidditch scenes were filmed here). Stop in to a traditional pub for an Irish music session and more banter! The port city of Galway will wrap you in its romantic charm. The Spanish Armada sought refuge off the coast of Galway from stormy seas in 1588 and many stayed as they found the people so welcoming and charming! Hopefully your time here will make as lasting an impression. With 2 nights in Galway you can venture further west into Connemara and experience some of the Wild Atlantic Way. Connemara is a place of intense beauty; barren landscape, stunning Atlantic views and welcoming villages serving some of the best food around. You will then spend a night in Mayo. Croagh Patrick is located about 10 minutes drive from Westport and is named after our famous Saint Patrick (yes, he gets a mountain and a day named after him!). If you dare, climb up to the top to see the small chapel (it only takes two hours!) and the beautiful Clew Bay which is overlooked by Croagh Patrick. Finally, finish off your tour with another night in Dublin where you can relax in the capital before you start your journey home! Absorb the charm of our capital city, be it a pint of Guinness in the Storehouse, the Georgian Squares or charming cobbled streets of Temple Bar, there is plenty to offer all types of visitor!